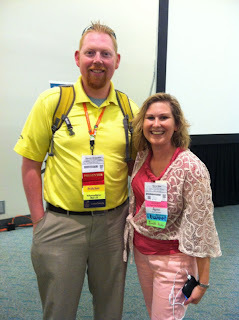 I've spent the better part of 3 days taking part in various parts of the #ISTE12 experience. (Basically, if you don't know, ISTE is the international conference for technology educators. This year it's in sunny San Diego.) I have had the chance to meet with educators and friends from all over the world. I've sat in on sessions and had conversations in the Bloggers Cafe and in the hallways and the one theme that keeps coming up over and over is connectedness. As educators, we are all part of something greater than ourselves and our classrooms. We have the power and potential to do something great. It is tough to do alone. But thank goodness for the power of connections. Getting plugged in and taking advantage of the power of others is an important step in our journey. I have made so many friends, and had so many wonderful opportunities. I am lucky I am a connected educator. I take pride in it as well. And spending time over the last 3 days mingling, mixing, chatting and conversing has recharged me and made me once again believe in the power we have. Whether you are in San Diego or not, we all have the power to get connected. You've already started if you are reading this blog. Maybe it came to you through your RSS or maybe you saw a link on Twitter. That's a first step. But take the advice from many here at #ISTE12. Make connections that matter. Spend time in your network talking and learning with and from each other. There are still 2 days of learning here and I can't wait to see what is around the bend. Thanks to @sraslim for the picture today!